Each week, our dedicated band of knitters and crocheters (our “Mission Craft”) produce toys and baby clothes to send overseas to “Mother’s Heart”, Cambodia. About one in five Cambodian women face unwanted or unplanned pregnancies in their lives. Many of these babies end up either trafficked, aborted or placed in an orphanage. “Mother’s Heart” is an organization which offers those women facing a crisis pregnancy, counselling, support, medical care and community involvement, so they can choose the best future for themselves and their babies. The lives of many babies are saved through this organization by their dedication to and support of the mothers, both during and after pregnancy. “Mother’s Heart” demonstrates the love of Christ towards woman in a crisis situation and offers them the opportunity and means to deliver their babies and give them a future. Do you know why God loves these babies so much? Because they are his handiwork! Psalm 139:13 says “For you [God] created my inmost being; you knit me together in my mother’s womb.” Every baby is precious to God. Now, Cityview’s “Mission Craft” team are enjoying the delightful task of making soft toys and baby clothes, which are destined for these precious children in Cambodia. 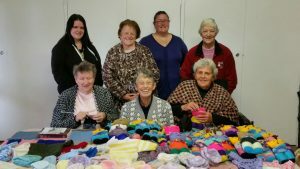 If you would like to join “Mission Craft” and knit some items to send to “Mother’s Heart” for the babies, contact Doreen Wheeler on 63635434. “Mission Craft” meets every Tuesday (of the school term) from 9.30-11.00 a.m. Enjoy great fellowship and a cuppa and allow your handiwork to bless these precious children.